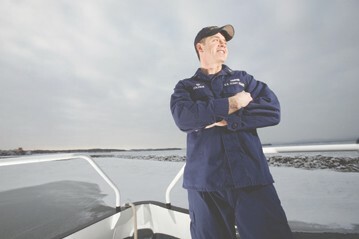 Louis Coleman describes his job as “one of the best-kept secrets in the Coast Guard.” And, judging from his office view overlooking Burlington’s harbor, it’d be hard to argue with him. Not that Coleman, the officer in charge of the U.S. Coast Guard Station Burlington, spends much time behind a desk, or on solid ground. Just outside his window stands a fleet of small- and medium-size craft ready to launch within 10 minutes of an emergency call from anywhere on Lake Champlain, from Whitehall, N.Y., to the Canadian border. Since 2008, Coleman has essentially been the lake’s top cop, commanding the 25 Coast Guard personnel responsible for most of the law-enforcement, search-and-rescue and buoy-maintenance operations on the water. Though most recreational boats are in dry dock for the winter, Coleman and his crew remain on the water, or ice, all year round. From May through October, Coleman can often be found on one of the station’s two 25-foot response boats, checking boater registrations, doing safety inspections, looking for drunk drivers and rescuing stranded boaters. His people also oversee regattas and boat races and set up the safety perimeter around Burlington’s annual Fourth of July fireworks display on the waterfront. In early spring and late fall, Coleman’s “ANT,” or aids-to-navigation team, does maintenance on the 170 buoys, beacons and lighthouses that guide travelers up and down the lake. In late fall, scores of buoys must be fitted with ice-proof hulls to protect them through the winter. This time of year, Coleman tends to focus on ice rescue. According to him, Burlington is the only Coast Guard station outside the Great Lakes with an ice-capable rescue unit, and its members train constantly. This year, the station added a second ice-rescue boat to its fleet, now based at Crown Point. Driven by a stern-mounted propeller similar to those of the air boats used in the Everglades, the ice boat can sail across water or ice at high speeds. Coleman, 41, grew up on a farm near the ocean in North Hampton, N.H., and began working on charter boats as a kid in Rye Harbor. Throughout his 18-year Coast Guard career, he’s never been stationed outside New England, and he says he’d stay put in Burlington for another 18 if he could. SEVEN DAYS: What’s the bulk of your work during the warmer weather? LOUIS COLEMAN: It’s recreational boating safety. Just making sure people have the required safety gear, that they have the right placards on board, that their boat’s OK to be on the water. People say, “Why’d you pull us over? We weren’t doing anything wrong.” It’s a safety check; that’s all it is. We’re not out there trying to arrest people or ruin everyone’s boating day. It’s just proactive search and rescue. SD: What’s the biggest problem you encounter? SD: What was your involvement in the Crown Point bridge demolition? LC: When they decided to implode the bridge, we set up the safety zone. Our initial concern was that people would drive across the ice [to get across] ... Then everything froze, and then our concern grew even bigger because people wanted to go out on the ice and watch [the demolition] ... My fear was that you’d have a lot of people on the ice, the bridge goes in the water, there’s a ripple effect and the ice becomes unstable ... But the weather cooperated; between the fog and the rain, the ice got thin. So not a lot of people went out there. SD: How frequently are you called on ice rescues? LC: This year’s been quiet so far … Normally, [we get] one to two cases per year and about one fatality per year as well. SD: What’s your recommendation for people going out on the frozen lake? LC: We don’t encourage anyone to go out on the ice, ever. No ice is safe ice ... People have this misunderstanding that we can hop into our truck and drive out on the lake [to rescue them]. We can’t … The primary rescue asset on an ice rescue is a helicopter, and Air Station Cape Cod is the closest [one]. SD: How quickly can they respond? LC: They can be on scene in about two hours, assuming they’re not busy on the coast. SD: What does that mean for someone who’s gone through the ice? LC: If you’re in the water, you’ve got 20 minutes, at best, life expectancy ... So, if people do go out on the ice, we encourage them to have a plan. Have a radio, a life jacket, and a way to get yourself out of there. Because the ice doesn’t freeze uniformly. It never does.